I have written another book, and it’s officially released today! 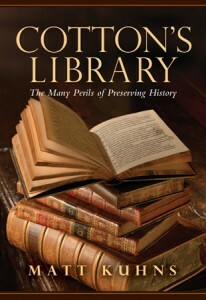 I hope you’ll check out Cotton’s Library: The Many Perils of Preserving History. Where Brilliant Deduction looked into real detectives who are (now) much less famous than fictional counterparts, Cotton’s Library looks into a priceless historic collection much less famous than individual items within it. The highlights of this collection include some of the most important documents of Anglophone civilization: the sole manuscript sources of Beowulf and Sir Gawain and the Green Knight, two of four surviving 1215 copies of Magna Carta, and the masterfully illuminated Lindisfarne Gospels. The English antiquarian Sir Robert Cotton brought all of these together around 400 years ago, along with thousands of other historic documents. Yet Cotton and his collection remain relatively little-known despite the renown of many individual items in his library, as well as a story both during and after Sir Robert’s time that almost defies belief. Cotton served time as a prisoner in the Tower of London twice, on dubious charges concealing royal discomfort with the library’s prominence among political critics. King Charles I ordered the library itself locked up in 1629; it remained sealed when its brokenhearted founder expired two years later. Through the centuries that followed, war, neglect, fires, corrupt library-keepers and later collectors’ poaching all threatened the collection’s ruin repeatedly. You can read a free excerpt here. I hope you’ll take a look!